The Chicago Youth in Music Festival has begun! In the past two weeks, the fellows have devoted most of our time to working with wonderful young musicians. We continued performing our arrangement of Don Quixote in Chicago schools and we attended the CSO School Concert of Don Quixote at Symphony Center. We also began our three-day residencies at three CYMF partner schools, and then we capped off an exciting week by assisting and performing with the Festival Orchestra. At the Catalyst Circle Rock at Sistema Ravinia, we were welcomed with a lovely performance by one of their orchestras. Then, we performed Don Quixote for them, and they loved it! At the end they actually sang their thank-you to us, chorusing that we did a good job. It was so inspiring! We also played with them in orchestra rehearsals and gave individual lessons to the students. We visited Mary Lyon Elementary, where the Chicago Metamorphosis Orchestra Project is housed. The audience was really engaged and actively participated in our performance, and they asked great questions afterward too. We met with the kids for a few minutes following the performance, and it was beautiful to see their passion for music, their instruments, and learning. They even asked us for our autographs which made us feel like stars! At Hibbard Elementary, one of the locations for the People’s Music School, we completed our residency. All of us have been teaching at People’s since September, so it felt like home. Here, we played side-by-side and led sectionals, and then we performed Don Quixote for the last time (this month at least!) to our biggest audience so far. It was beautiful and meaningful to perform for our own students. The CYMF Orchestra met over the weekend to prepare for an open rehearsal with Maestro Riccardo Muti on Tchaikovsky Symphony No. 4. There are thirteen different partner organizations for 2017, and many of them send their students to this incredible event. 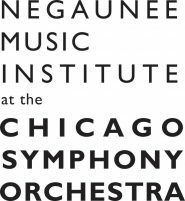 We had two full rehearsals led by CSO Principal Trombone Jay Friedman and sectionals with CSO musicians, all leading up to the open rehearsal with Maestro Muti. Stay tuned to find out about the open rehearsal in our next post!